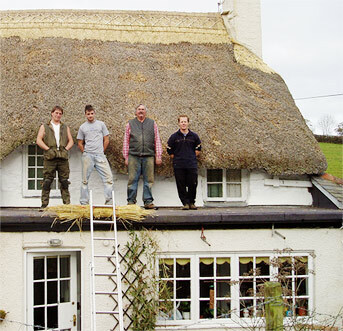 Post Cottage is a 500-year-old thatched cottage in the hamlet of Littlehempston, which is 2 miles from the historic Elizabethan market town of Totnes on the river Dart. We have one twin room, one double, and one single. Guest sitting-room with beams, log fire, TV, board games. Cottage gardens, stream, easy parking. Homemade bread, jams and marmalade, and fresh eggs from our battery rescue hens. Complimentary tea and coffee. Friendly cat, lots of books, local guides and maps. Good pub a few minutes away. Many kinds of birds in the garden and adjacent orchard. And darkness! Come and see the stars. Convenient for Dartmoor, the river Dart and Dartington Hall with its famous gardens. A couple of hours from the Eden Project. The famous Riverford Field Kitchen is only a short drive away. All diets catered for. Open all year. Regret no smokers, young children or pets. We have two excellent pubs nearby. The Tally Ho is now a community pub owned by the village and is within easy walking distance of Post Cottage, and you'll find the Pig and Whistle at the other end of the village.